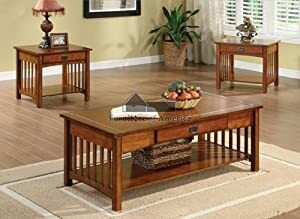 This listing is for a brand new "Seville" Mission Style Coffee Table with 2 matching End Tables. The solid construction and design of these tables carries an elegance and weight that really sets them apart. Features include all hardwood solids with a rich oak finish and durable wood veneer. All 3 tables come with a functional center drawer. The antiqued black metal handles add an elegant touch. The shelves on the bottom provides plenty of space for magazines, books or accessories. Brand new in original cartons. Don't miss your chance to own this unique coffee table set at a fraction of the retail price.